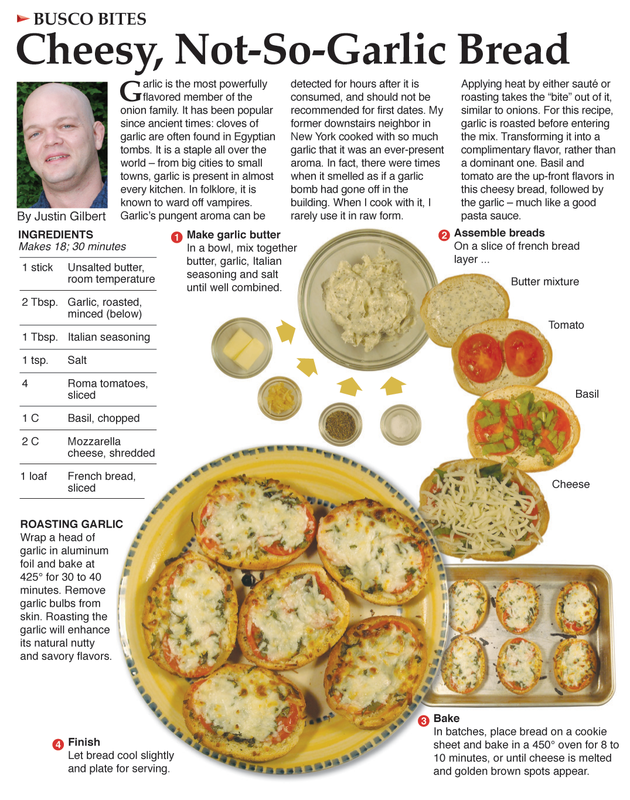 When I set out to create this recipe I wanted it to be a garlic bread, only I didn't want the garlic to dominate the flavor. In order to tame the garlic, I roasted it before adding it to the compound-butter that is slathered on each slice. After roasting a whole bulb in the production kitchen, the garlic aroma in the air was far more dominant than the actual flavor on the bread. This is the way I like garlic, though, subtle and more of a base flavor rather than a dominate-your-senses-flavor. I'm very proud of how this dish turned Out. As described in the introduction, the first flavors to hit the palette are basil and tomato, then the garlic. The garlic is prominent but it doesn't present itself until after the garden-fresh flavors of the basil and tomato. It's a simple appetizer, or complimentary bite, but it really has some depth. 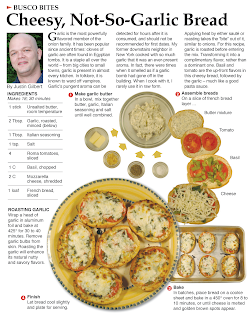 In my research, I found many references to garlic as a staple in nearly every kitchen in the world. It occurred to me that one of the few kitchens where garlic is NOT found was in my mother's. She has an allergic reaction to garlic and it will make her physically ill if she eats to much of it. It wasn't until I was out on my own and cooking for myself that I discovered the wonders of this little pungent aromatic. It didn't take long though after I discovered garlic to realize that if you're not careful, it will take over and absolutely dominate a dish. In my garlic cooking adolescence I made a meatloaf and threw in handful of minced garlic to the mixture - the end result was a not a meatloaf but a garlic loaf. The leftovers didn't even last long in the fridge because after only a day or so the fridge had turned into garlic-central and I was afraid it would taint everything in it. I'm going in a different direction regarding plating the food for the final photograph that is usually the dominant art in each recipe. When I first started the column I tried to use all white dishes for the main art and clear cups for the prepped ingredients, I thought that it would help the food stand-out. When looking back at past recipes, I found that the plates and dishes used for the main art just blend in with the white background. With this recipe, I use a plate that has color and a nice design motif. I think it helps the final stage of the cheesy bread rise off the background. It is a direction I'm going to be taking the column from an artist's stand point. I really like the pop I get from a unique plate underneath the final product. I had a great time joking around about garlic in my notes, which I eventual boil down to add a little humor to the introduction of the column. "It's probably not a good idea to eat a bulb of garlic before a first date. If you do, make sure your date does also. If that happens, make sure it's not a double date, unless of course, your meeting up with vampires."